경북 풍기에서 발견된 이 용두는 보당(寶幢)에 번(幡)을 매달 때 줄을 거는 역할과 당간 꼭대기에 올려 장식하였던 장치이다. 금동의 역동적인 용이 입안에 여의주를 물고 있으며, 여의주 뒤로 줄을 거는 도르래가 장착되었다. 용은 눈을 크게 뜨고 정면을 응시하였으며 얼굴 주위와 목 뒤로 굽이친 듯 갈기가 장식되었다. 목에는 비늘이 선각되고 전체적으로 화려하게 도금되어 당시의 모습을 짐작케 한다. 사찰에 쓰여진 보당의 형식과 그 위에 올려진 용두장식이 실제로 밝혀진 중요한 자료이며 통일신라 전성기의 금속공예 기술이 잘 발휘된 걸작이다. 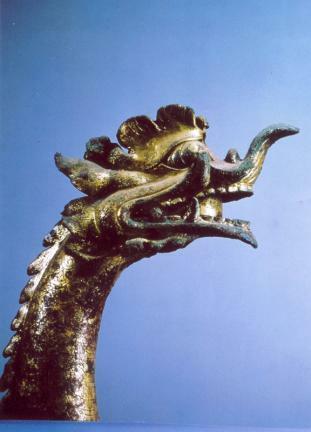 This gilt-bronze dragon head-shaped finial features wide open eyes. The dragon has a magic bead in the mouth, with the upper lip extended upward in an “S” shape and the long, sharp upper and lower canine teeth bent sharply upward. Its outstretched neck and head add dynamism to the entire body. The dragon’s scales are incised on the body in two lines, with diverse floral patterns carved inside each scale. A pulley is built into the inside of the mouth where it is connected to the neck and is fastened with a rivet at the molar tooth. The device appears to have been designed for real movement but is now badly corroded, losing its intended function. This dragon ornament at the top of a pole is a rare example of its kind from the Unified Silla Period and is consequently an invaluable artifact in terms of the metal handicraft, sculptural styles, and architecture of the Unified Silla Period (676 - 935). The use of a pulley also provides information as to the level of science of that time.